Sharma had told reporters in Jammu yesterday that his visit was fruitful and he would be visiting the State again and again. 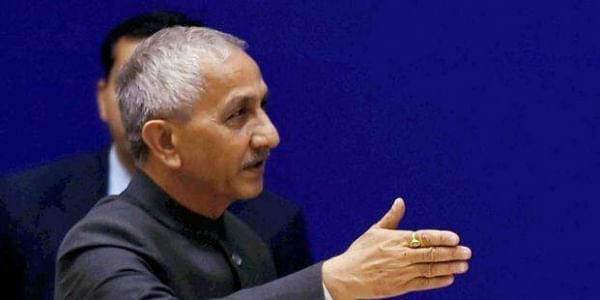 SRINAGAR: The central government appointed interlocutor on Kashmir Dineshwar Sharma on Saturday said the interlocution process would continue for at least two years and described his first visit to the State as “good”. Talking to New Indian Express on phone today after completing his maiden five-day visit to the State, Sharma said, “It was a good visit”. “It was my first visit to the State as interlocutor and there would be lot of such visits,” he said. Sharma wrapped up his five-day visit to the State. He had arrived on first visit to the State on Monday after being appointed as interlocutor by Union Home Minister Rajnath Singh on October 23 for holding sustained dialogue with stakeholders in Jammu and Kashmir. He spent three days in Valley and two days in Jammu and met many political and apolitical delegations including Chief Minister Mehbooba Mufti, Governor N N Vohra, ruling PDP and BJP delegations, traders, youth, etc. However, the separatist leaders in Kashmir had refused to meet him saying it was “time buying tactics” of New Delhi while main opposition party National Conference stayed away because the party had not received any invite for talks. The main trader bodies and civil society groups in Kashmir also stayed away from him. “After one visit, I can’t make any comment,” he said. In response to a question, Sharma, former IB director, said the interlocution process in the State would carry on for at least two years. “Do you expect the solution to come in a one meeting or one week? It will take time,” he said. “If I remain interlocutor for two years, you ask me this question after two years. However, if I am removed in six months, then I will not have anything to say,” added Sharma. Earlier, Sharma had told reporters in Jammu yesterday that his visit was fruitful and he would be visiting the State again and again. Sharma’s first visit to the State, however, did not general much political heat and enthusiasm among the stakeholders in the Valley and according to political leaders, ex-interlocutor and political analysts it was due to conflicting statements of central ministers on his appointment, non clarity on his mandate and non announcement of Kashmir-specific confidence building measures by the government.